What is CPU Usage and Memory Usage? CPU Usage- It is the amount of time a CPU was used for processing the given instructions. Entry Processes- It is number of scripts are running at a single time. One entry process take fraction of a second to complete. So in 10 entry process you can have 10-30 visitors. 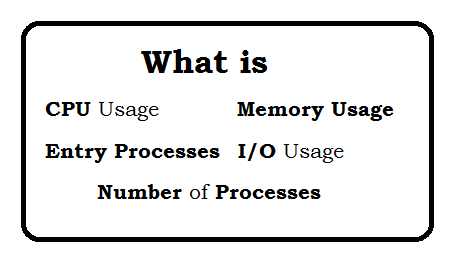 Number of Processes- It is number of process(script) can run in one time. One process take time till the execution of script. I/O Usage- It is speed of data transfer between the hard disk and the RAM. How to add Meta Tags for Linkedin. How to put online your WampServer? - Access Local code globally. How to change the Internet Zone security level from High to Medium and Vice Versa. What is RTMP, RTMPT, RTMPE, RTMPTE and RTMPS protocol?.